Posted on 12/5/2018, 12:28 pm, by kittykill, under Handmade Gift Ideas, Holidays. When I say Christmas Crack I am not talking about Uncle Stan bending over to grab presents from under the tree. I am talking about the most delicious treat known to man. 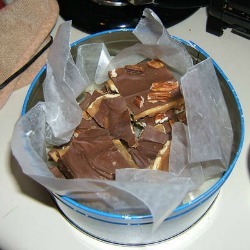 Years ago Mistress Jennie posted a recipe for Christmas Crack and the angels sang. Never has a sweet treat been so easy to make yet so unbelievably scrumptious. The ingredients cost next to nothing, and you can add toppings such a nuts, peppermints or even SPRINKLES! Whip up a batch for yourself and for friends this holiday season. From sweet treats to saucy dishes, our Handmade Holiday Gift Guide has the right gift for the right person. This “cracks” me up every year!